Leg spasms, also known as muscle cramps, are involuntary muscle contractions that fail to release, states the American Academy of Orthopaedic Surgeons. 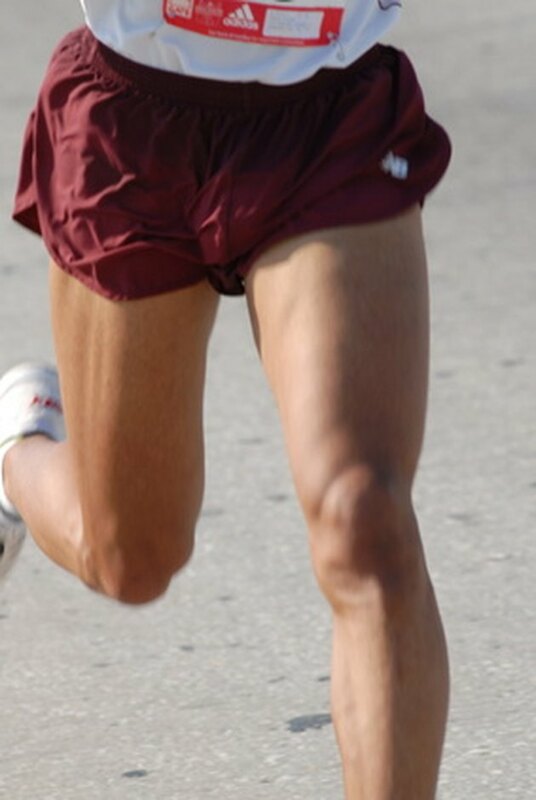 Cramps affect skeletal muscles but typically occur in the hamstring, quadriceps and calf areas. Leg cramps can range from mild to moderate pain and last from a few seconds to 10 or more minutes. Cramps usually resolve without medical intervention. However, prolonged cramps may require medical intervention to determine the cause of the leg spasms. The compression of nerves after they leave the spinal cord can cause leg spasms. Spinal nerve compression can create conditions that affect the spinal column, such as osteoarthritis, spinal tumors and herniated disks, according to MayoClinic.com. These conditions typically affect nerves that run through the legs, which may trigger leg spasms. Leg spasms usually worsen when sitting for long periods of time or doing strenuous physical activities. Individuals who experience frequent leg spasms may need to consult a physician for advice on spinal conditions that can trigger leg spasms. The American Academy of Orthopaedic Surgeons explains that leg spasms may be caused by an electrolyte imbalance. Electrolytes are chemicals in the blood that regulate important body functions. When a person sweats during exercise, potassium, calcium and magnesium levels are depleted. Certain medications may also affect the chemical balance of these nutrients, which can create leg spasms. To prevent leg spasms, a patient should eat balanced meals to adequately supply nutrient levels and prevent leg spasms. Patients on medications may need to monitor their blood levels to ensure that electrolytes are balanced. Poorly conditioned muscles may contribute to leg spasms, reports the American Academy of Orthopaedic Surgeons. Although researchers do not understand the exact cause of leg spasms, they believe that out-of-shape and weak muscles are more likely to cause muscle spasms. Muscles are bundles of fiber that relax and contract to move the joints and bones of the skeletal system. The signal to relax or contract is transferred by nerve cells that communicate with cells within the muscles. Poorly conditioned muscles lack muscle and nerve communication, which can alter normal nerve reflex functions, which can lead to leg spasms. Individuals who experience frequent leg spasms should participate in regular physical activity to reduce the likelihood of leg spasms and strengthen muscles within the leg region.